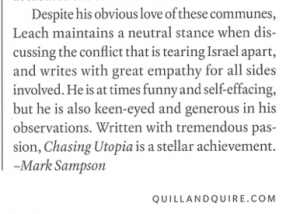 So yesterday I got my first review in Canada—and an influential one at that—a starred review in the book-industry trade magazine Quill & Quire. 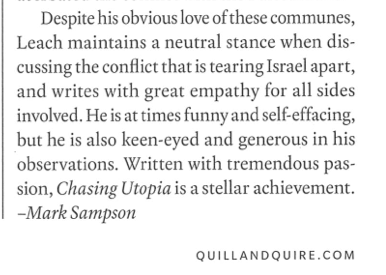 And to me great relief, reviewer Mark Sampson raved about Chasing Utopia. The full review isn’t online yet, so here is the final paragraph—the kind of blurb-ready summation that every writer dreams of getting.